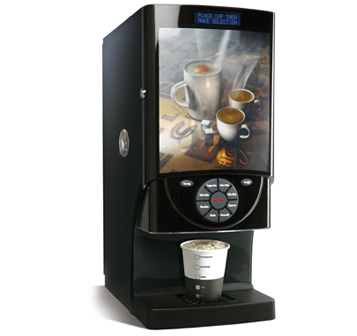 The New Classic is the perfect machine for even the smallest business and offers real flexibility. 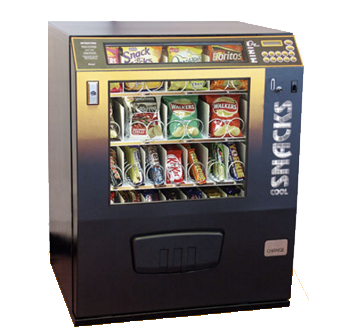 Available as five selection free vend, or four selection coin controlled with storage for sugar sachets and stirrers. If you require complete coin control a three selection version with integral sugar dispenser is the answer. The New Classic can also be fitted with the I-Key cashless payment system. Mains water connection or hand fill. For a greater selection of in-cup drinks why not consider the Elite? 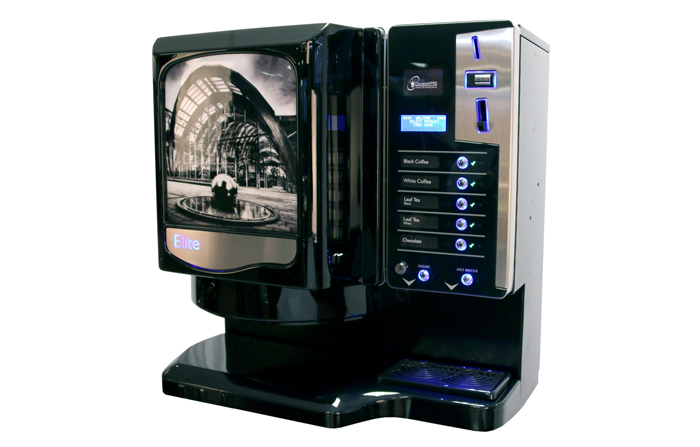 This superb machine offers five drinks choices and an integral sugar dispenser. The Elite can be sited on an existing work surface or if required, an optional base cabinet is available. 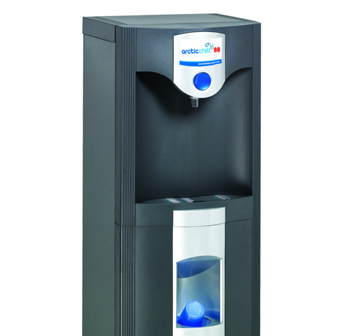 You can choose from a range of payment options including the I-Key cashless payment system.The Elite can be connected direct to mains water or can be hand filled if required. The Elite is fully compatible with the Ice Break Can Vendor and the new Snack Break Mini snacks vendor. 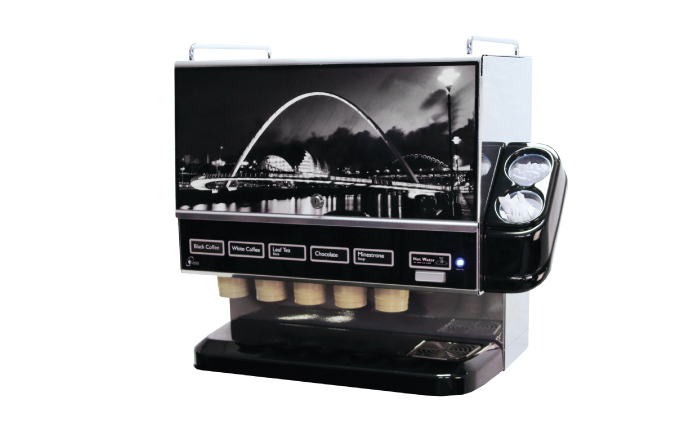 With five in-cup hot drinks or with the optional chiller, this stylish machine offers a high drinks capacity with ease of operation. 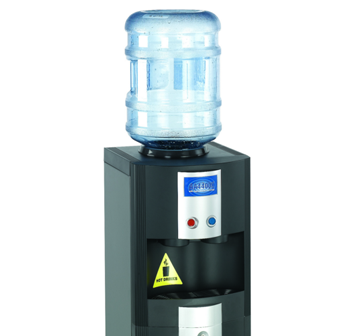 Integral sugar dispenser is fitted to maximise the number of selections. Free or coin operation, this unit can also be specified with a change giving coin mechanism and the I-Key cashless payment system. 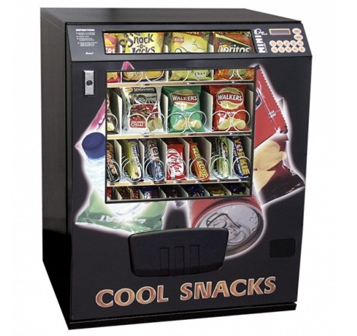 The Style Five can also operate with the Ice Break Can Vendor, Snack Break Mini and the Snack Break snacks machine. 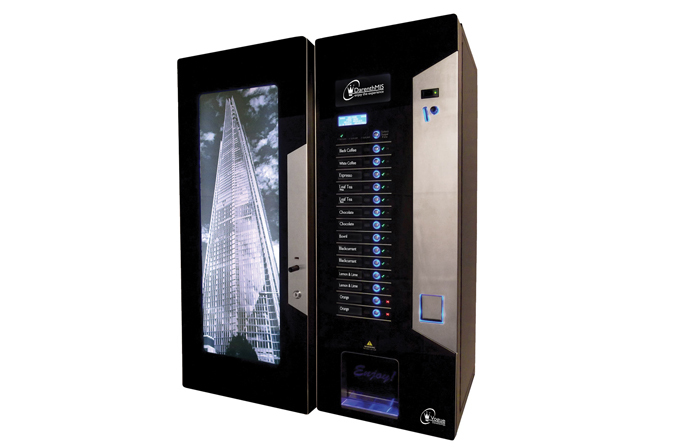 With ten drink selections and a total capacity of 740 this exciting machine will serve the needs of the medium to large size business. Hot drinks only or with the optional chiller, one or more cold selections can be offered. Can be free vend, or coin operated. A change giving coin mechanism can be fitted as can the I- Key cashless payment system. Getting your drink is simplicity itself ! 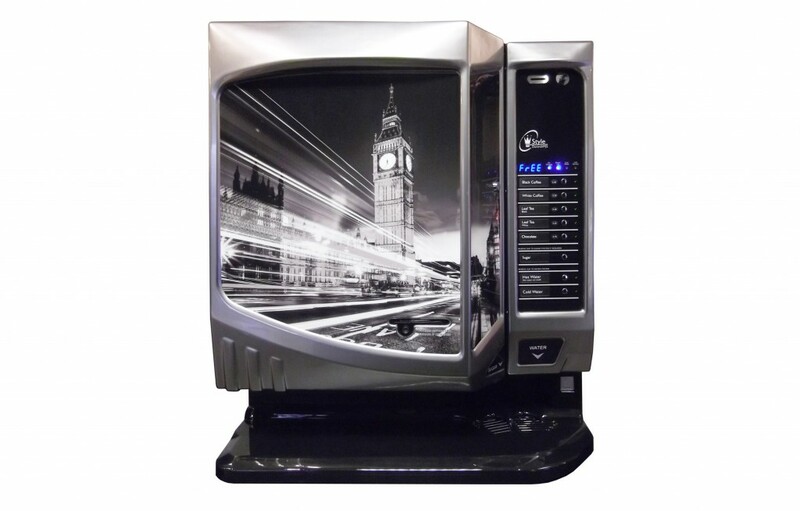 Fully automatic operation delivers your chosen drink to the illuminated cup station, the door opens automatically, you take your drink and enjoy it! The Vogue can give even greater drinks choice when sited on the Ice Break Can Vendor or the Snack Break Mini snacks machine (shown below). 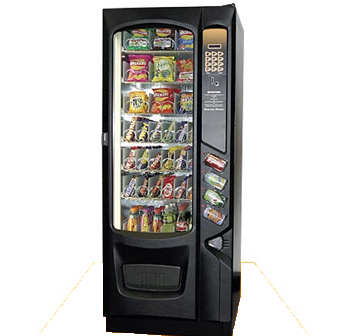 The Snack Break snacks machine can be interfaced with the Refresh 700 to give you a complete refreshment centre. The perfect companion for your new in-cup machine. 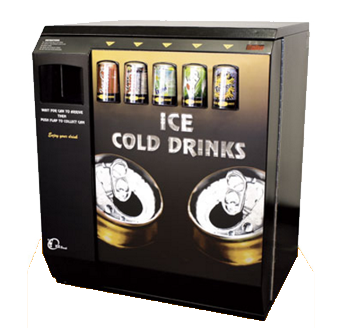 Offering 5 Ice Cold selections and uses the coin operation of your hot machine or can have its own stand alone coin mechanism. The perfect solution for all weathers. Available for Rent or Lease. Designed to be used with one of the Darenth drinks machines this new unit will serve snacks, confectionary and even ice cold cans. 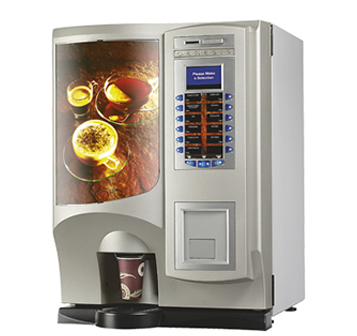 Uses the coin mechanism of the drinks machine or can be fitted with its own coin control. A Remarkable Machine. Twin Freshbrew Drinks. Real Freshbrew Coffee & Real Freshbrew Leaf Tea also Chocolate, Chocomilk, Cappuccino, Espresso, Caffe Mocha, Cafe Latte, Extra Milk & Sugar, with Use Your Own Cup or a Fashionable Paper Cup. Just has to be good! Mmmm! Smell that aroma! The Colibri grinds the beans and makes your very own cup of coffee. The very latest in high quality Bean to Cup systems. Also serves creamy, whipped chocolate and cappuccino as well as authentic espresso. A leaf tea version is available as is an automatic version which will dispense your drink into a disposable cup. For Office, Pub or Club. 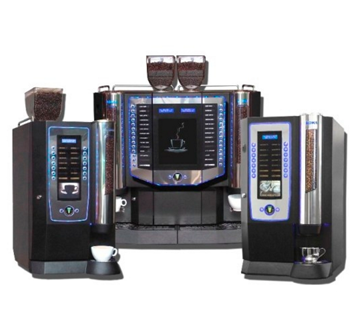 The New Sovereign series offers multi selections of Cappuccino, Regular Coffee, Cafe Creme, Espresso, Chocolate, Chocomilk, Hot Water and more! High quality drinks served super fast. Compact and stylish, this contemporary modern dispenser will compliment your company offices, conference rooms and reception areas. 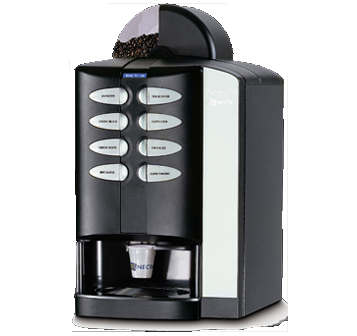 It is equipped with an ingenious new rocking system, which allows you to easily make your favourite drink. 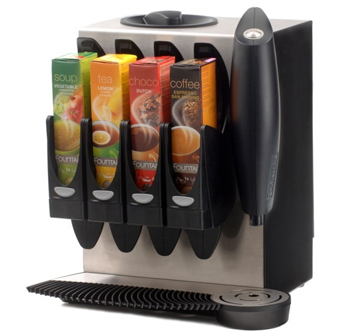 4 cartridges can be selected allowing you freedom of choice from our range of over 40 different drinks. Simple to use, easy to maintain. This compact unit offers a choice of three drinks plus whitener and sugar. 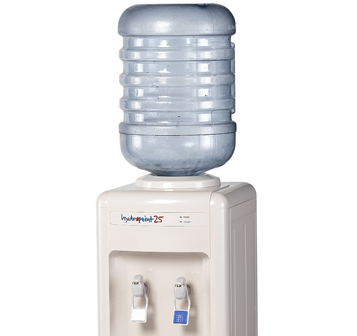 Plumbed direct to water mains or can be hand filled if required. Free vend or coin / token operation. 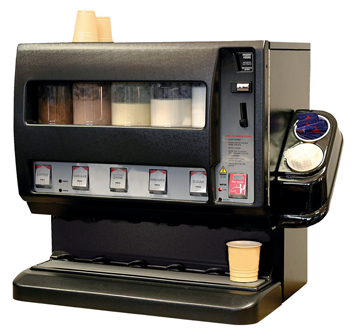 With an integral cup dispenser and side mounted storage for stirrers. A matching base cabinet is available as an option. The most versatile drinks dispenser. Offers four drink selections of self fill ingredients plus whitener and sugar and three coffee strengths! With an integral cup dispenser. Has the option to dispense in-cup tea bags. 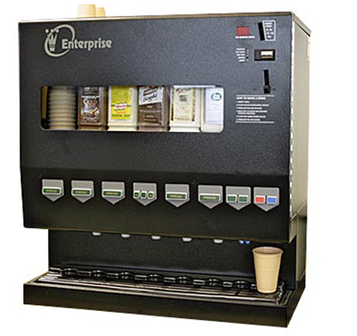 The Enterprise can also serve chilled still or carbonated fruit drinks plus chilled water. Free vend or coin / token operation. Optional matching base cabinet available.